As NPQ has widely covered, evidence has been mounting for some time now that most of the factors that determine whether you’re healthy or not are social in nature, not clinical. 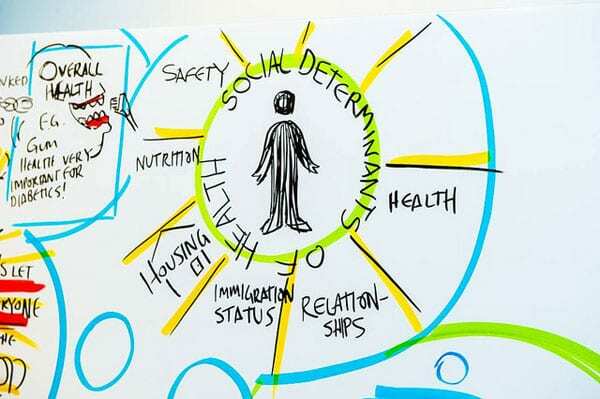 These so-called social determinants of health, whether economic, environmental, or behavioral, influence at least 80 percent—by some measures, 90 percent—of health outcomes. At the level of rhetoric, at least, much of the healthcare world has embraced this outlook. At the level of practice, however, progress has been more uneven. Slowly, however, healthcare practice is catching up with the science, with a growing number of health systems investing in community loan funds or housing because these investments ultimately keep people healthier—often more so than miracle cures or other alternatives. For instance, last spring, NPQ profiled a Toledo hospital (ProMedica) that partnered with Local Initiatives Support Corp. (LISC) to create a $45 million fund ($25 million in loans and $20 million in grants) to support neighborhood-based economic development. Last fall, NPQ also profiled a hospital in Columbus, Ohio (Nationwide Children’s) that has participated in a decade-long partnership that has invested $22 million in affordable housing to date. The creation, in partnership with the nonprofit Enterprise Community Partners, of a new joint equity fund called the Housing for Health Fund, with a focus on the nonprofit’s hometown of Oakland, California. That fund has committed $5.2 million to help a local nonprofit, the East Bay Asian Local Development Corporation, purchase a building in East Oakland. The formation of a nationwide loan fund, in which Kaiser and Enterprise are each committing $50 million. The housing crisis, Peters notes, is particularly acute in Kaiser’s home city of Oakland, where rents jumped 51 percent between 2012 and 2017. Between 2015 and 2017, homelessness in the city grew 25 percent. Homelessness in the surrounding county of Alameda has jumped 39 percent. “If you take an area like California, you have the dilemma right in front of us: On one hand, you have extreme wealth, expensive homes, etc., and on the other hand you have homelessness,” notes Bernard Tyson, Kaiser’s CEO. Of course, $200 million, although certainly significant, is still a relatively small number for a company with over $70 billion in annual revenues. The hope is that Kaiser can build on its initial investment over time. Kaiser, because of its strong presence, especially in California, is well positioned to test the model, since many people who it serves through its housing investments may well be Kaiser-insured members. This means Kaiser may be able to track how much their health improves. If Kaiser patients stay healthier in their new homes, Kaiser may be able to recoup some—maybe even all—of its investment in reduced insurance payouts. Correction: This article has been altered to reflect updated and corrected information from Kaiser regarding its investments.